It feels like it's been quite a while since work began on on our home renovations. 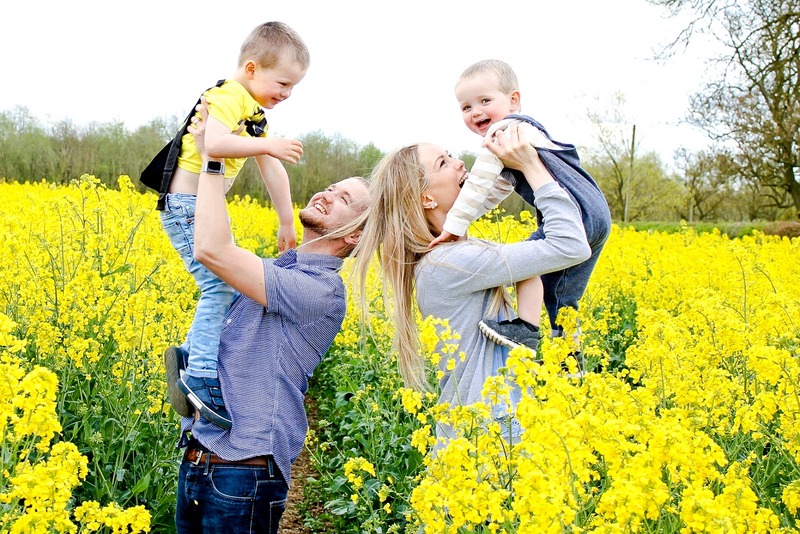 The past few months living through the extension and all of the other things that we've been having done to make our house our forever home haven't been the easiest to live around especially whilst having two little people aged five and three years old. But, seeing all our hopes and dreams finally start to come together as we add the finishing touches to the rooms reminds me how completely worth it has all been. Ethan's new bedroom is finally nearly exactly how we had hoped it would be, it isn't 100% finished, we have a few more things to add, though it's not much. It's only little things like a rug, as we hadn't quite realised how much floor space he's gained from the extension and also some more bunting for the other window as I hadn't realised that I had ordered the wrong size. We've really worked so hard on this room and we're so pleased with the result. One of the things that really pushed us to get this finished so quickly was receiving an email from the Argos Home team who rather excitingly wanted to collaborate with us and help us to give Ethan a room that was perfect for him now and that would also grow with him over the years. And we feel we have completely achieved that for him. 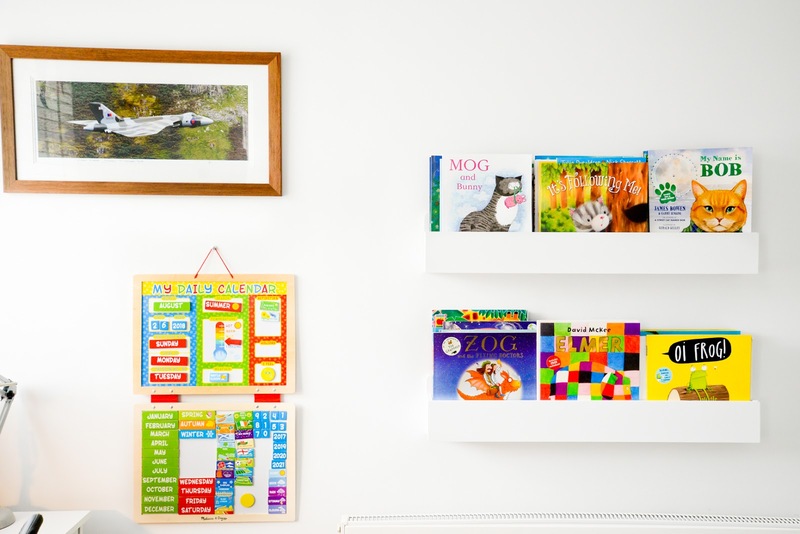 I'm going to share a full bedroom makeover once it's all completely finished, but for now I want to show you some of our Argos Home finds that have helped to make this room one of our favourite rooms in our home. 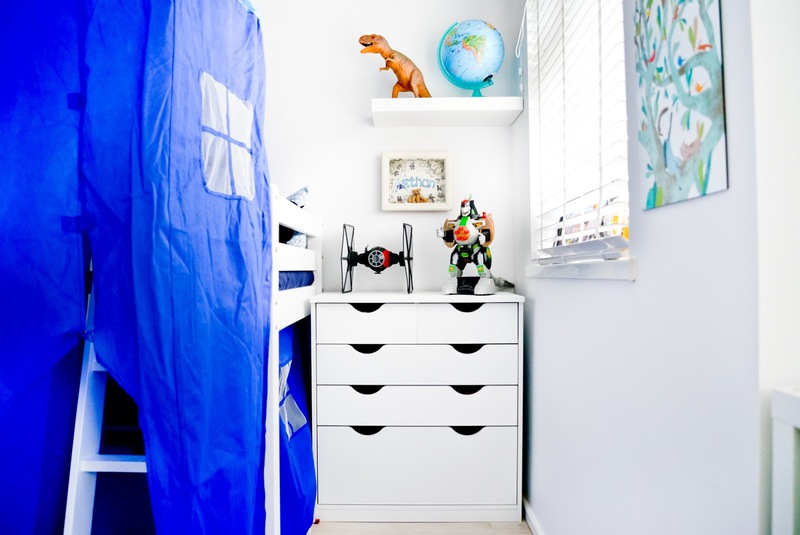 I didn't really set out with a theme for Ethan's bedroom, we sort of just seemed to fall into a bit of Star Wars / Lego theme because of the things that he already had. There definitely seems to be a bit of blue and white theming going on too, but again this was unintentional. We really just wanted something that reflected him and his personality. We were always going to make sure that he had a desk in his room. It was probably the main reason for moving Ethan into Logan's old room once it had been made bigger. Ethan is such a creative child, he loves nothing more than creating Lego models, drawing pictures, colouring, crafting and writing in his notebook. 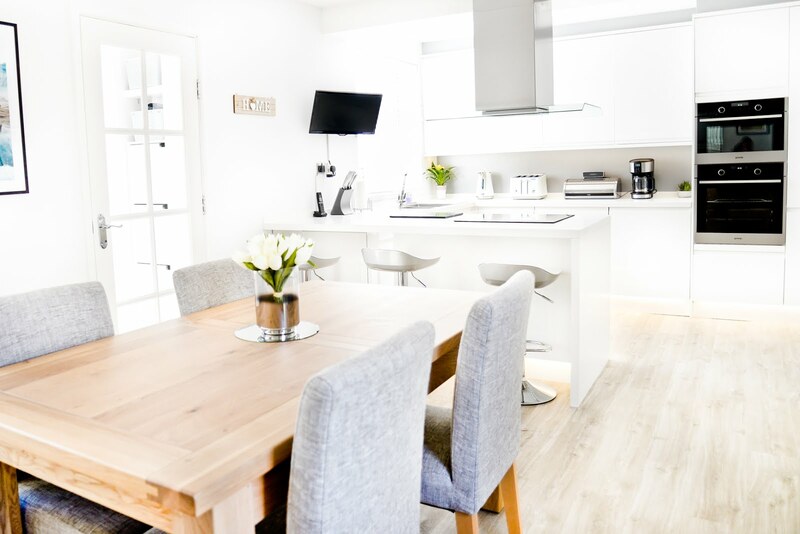 So this white New Pagnell Desk from Argos Home is absolutely perfect for him. It has three handy drawers for all of his stationery, his colouring books, notebooks and lots more. The drawers hold a lot and it's so nice to have all of his stationery organised for him at last. The bottom drawer is deeper so it's perfect for his collection of colouring books. And his new office chair fits with the desk perfectly and is so comfortable to sit at. It's the Argos Home Reade Mesh Gas Lift Office Chair which can come in several colours. The seat is adjustable, it has a swivel mechanism and a really lovely chrome frame. 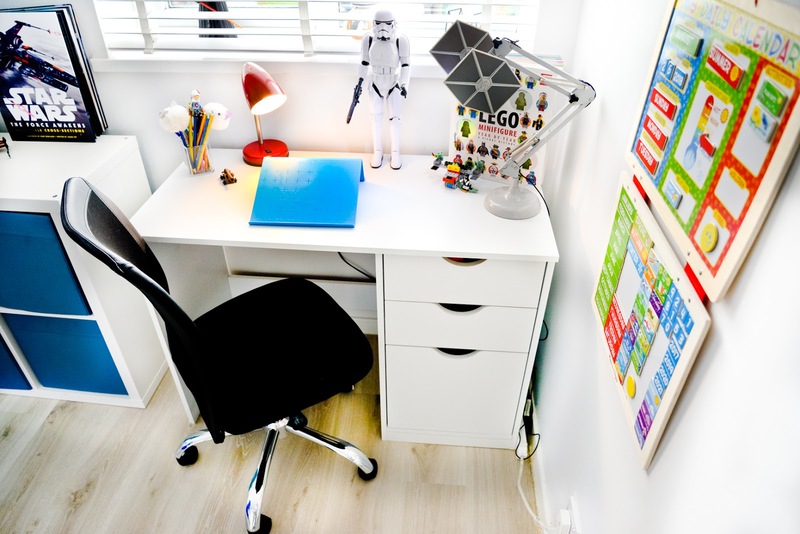 I think it fits so well in his room with his desk space. We loved the Argos Home New Pagnell range so much that we decided to also get the New Pagnell Deep 3+2 Drawer Chest Of Drawers and also the wardrobe (below) too. I think what I like the most about this range is the cut-out handles that give it a really modern look that will last right from Ethan's age now right up until he's much older in his teens. With his chest of draers we are using the two smaller drawers at the top for socks and pants and then we have school clothes and pyjamas in the drawers below. The bottom drawer is quite deep so is perfect for extra toy or shoes or anything else that you want to use it for. 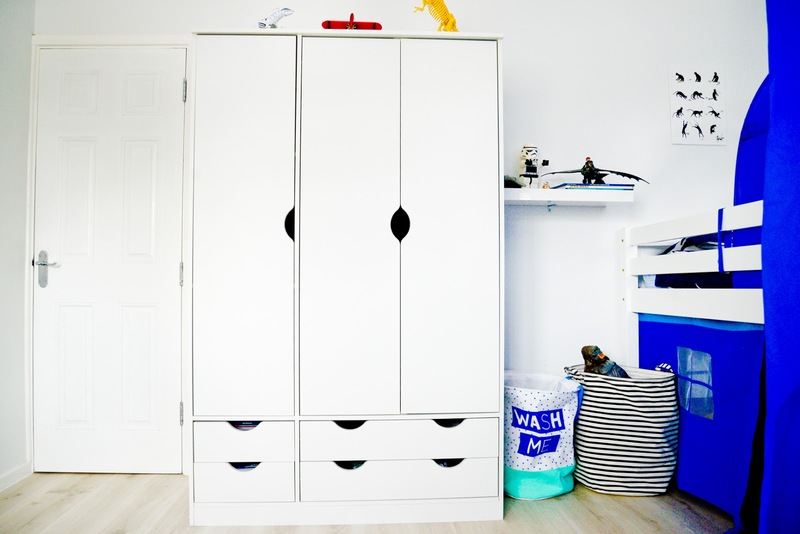 Ethan's new wardrobe is the New Pagnell 3 Door 4 Drawer Wardrobe and it is absolutely perfect for his room with it really suiting his age and being quite modern-looking. As with all of the New Pagnell range at Argos Home, it's a piece of furniture that is going to grow with him and last. See below to find out what it looks like inside. The inside of his wardrobe is so spacious. 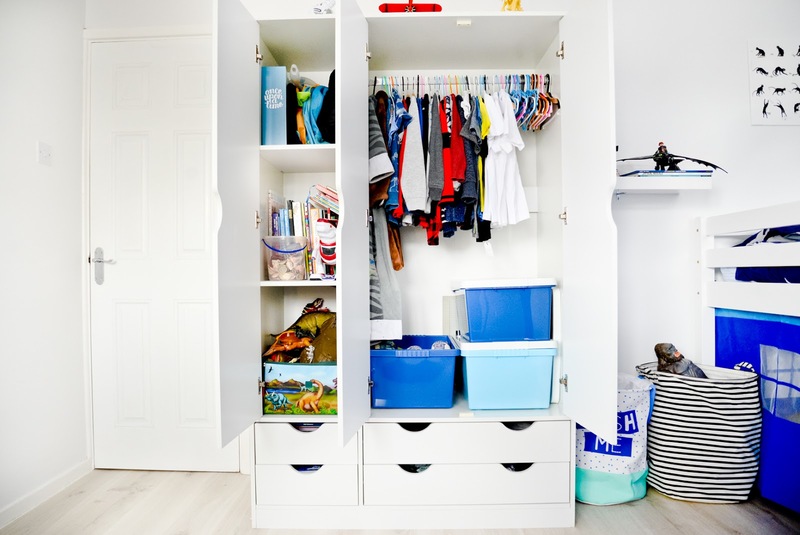 The wardrobe features 3 doors, 4 drawers, a hanging rail for clothes and also shelving which is the perfect size for his extra toys, extra books, his Trunki and his bags. We've used the two shorter drawers for his magazines and sticker books and we've used the longer two for all of his trousers and jeans in the top one and all of his shorts in the bottom longer drawer. We've got tons of hanging space on the rail and room underneath giving us extra storage. We've used storage boxes also from Argos Home in this space, they are the Argos Home Set of 3 Storage Boxes with Lids and we've stored things like Ethan's Lego smaller base plates in them and other toys. They're at the perfect height for him to reach so it's really nice to have that extra storage space below his clothes rail. 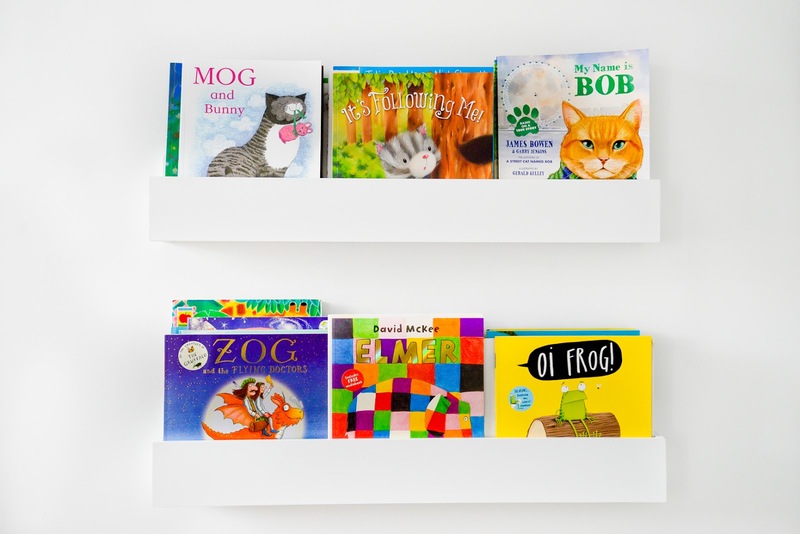 Above Ethan's radiator we've added in these really lovely 80cm white bookshelves which are actually a new product for Argos Home. I absolutely love them because they fill that space, they look colourful and they are just a really great way to store his books. What I love the most about these particular bookshelves is that they slot inside and are enclosed so you can display them front on but they can't fall out. I also think they are incredibly good value at just £14.99 each. 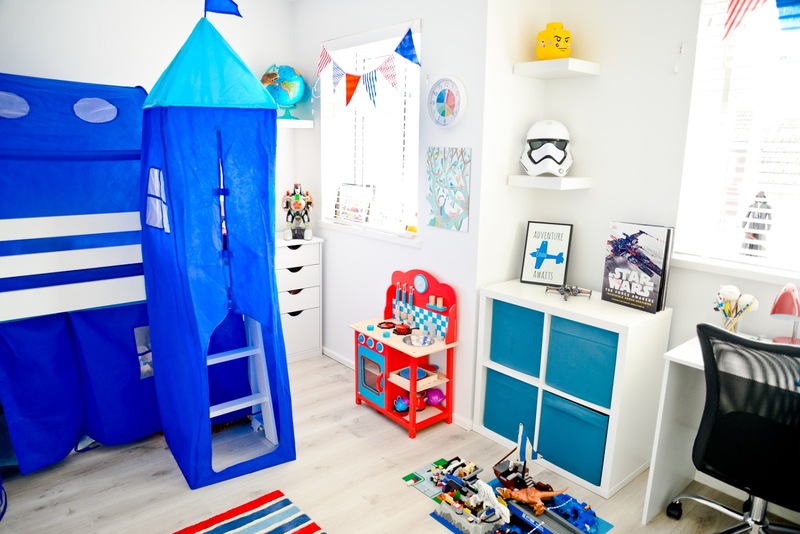 Finding the perfect bedding set for Ethan's new bed was super easy, I wanted something that like the rest of the room suited his age now but that would also last him and this Large Scale Navy Star Bedding Set from Argos Home, another new product to Argos Home, is perfect. 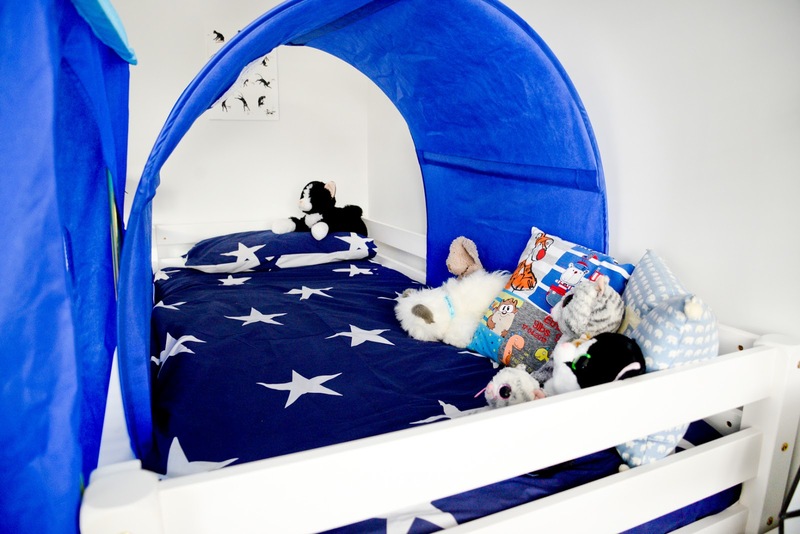 I love stars when it comes to children's bedroom decor and the blue colour suited his bed and the rest of the blue colour that we have in his bedroom. At just £12 I think this bed set is an absolute bargain, you can even buy it in toddler-size for just £9! Another new addition is this Argos Home Wash Me 62 Litre Laundry Bin which I loved as soon as I saw it. 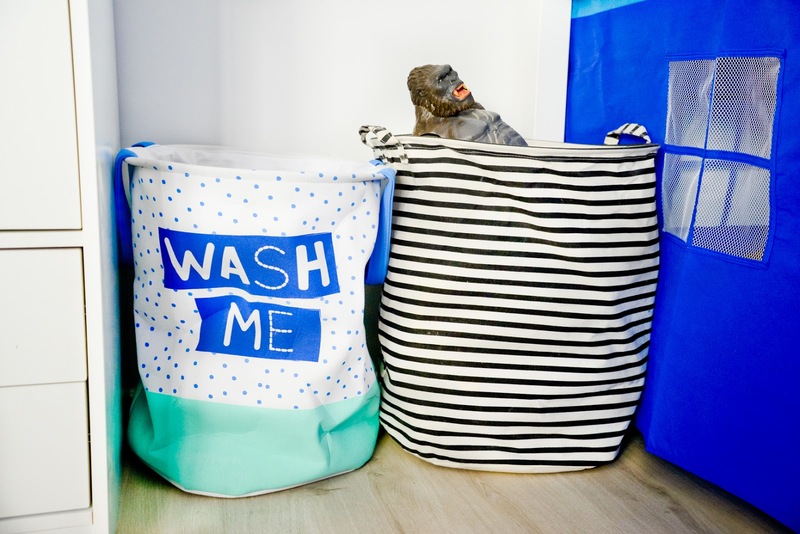 Who knew laundry bins could match so well with the decor?! The handles on the top are really handy for transporting the bag about if I need to and it holds a lot of washing in too. It's really great quality and seems to be quite strong and durable. Plus it's currently half price at just £6.99 which is a steal! 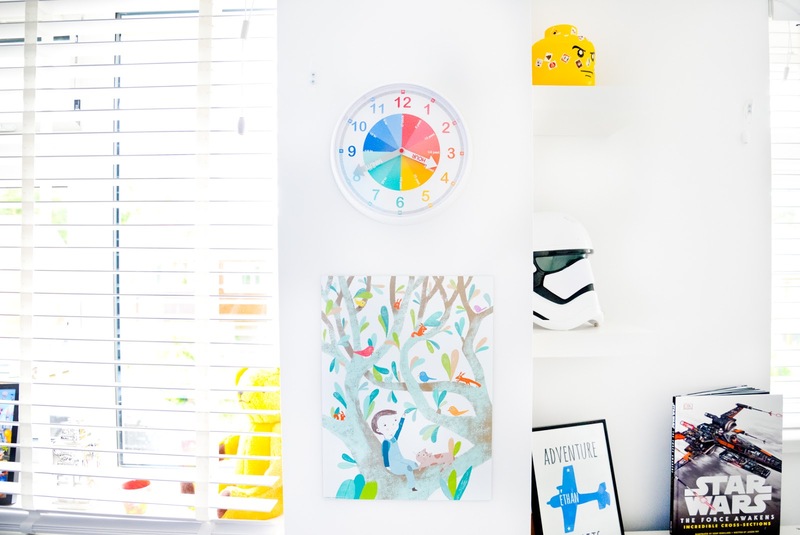 I love the splash of colour that Ethan's new wall clock brings to his room. I also really like that it features easy to read numbers, colours that break up the different time sections and labels on the hour and minute hands to help him to learn how to tell the time. As soon as I saw it I knew it was the perfect choice of clock for his room. 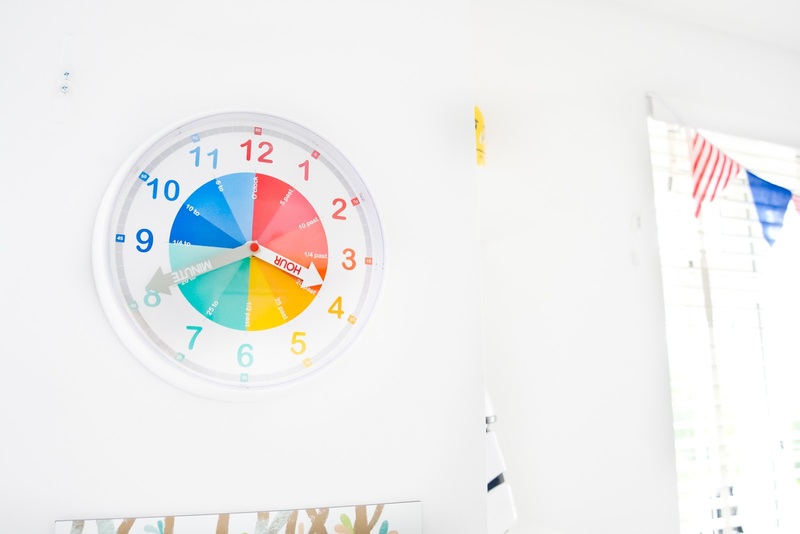 It's a lovely children's bedroom clock for just £10 which would also look lovely in a playroom. 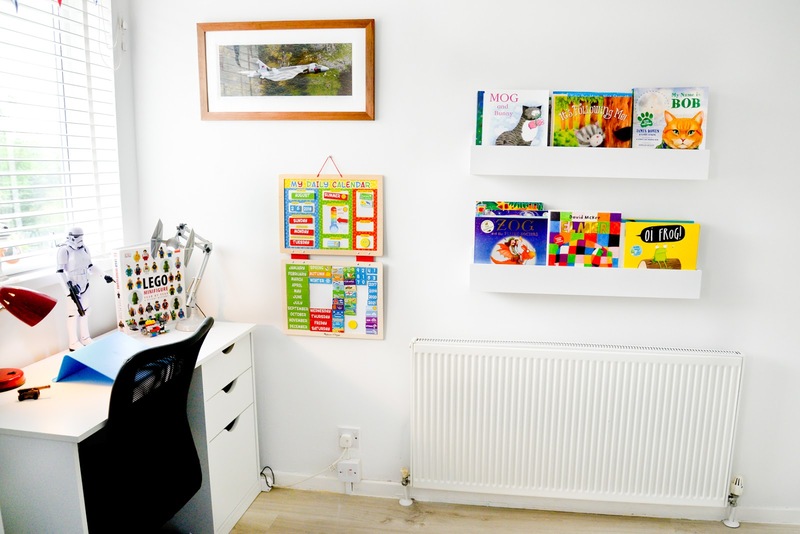 We are absolutely thrilled with the Argos Home children's products that we have in Ethan's room. Everything that we got has added exactly what we had hoped it would add to his new bedroom. 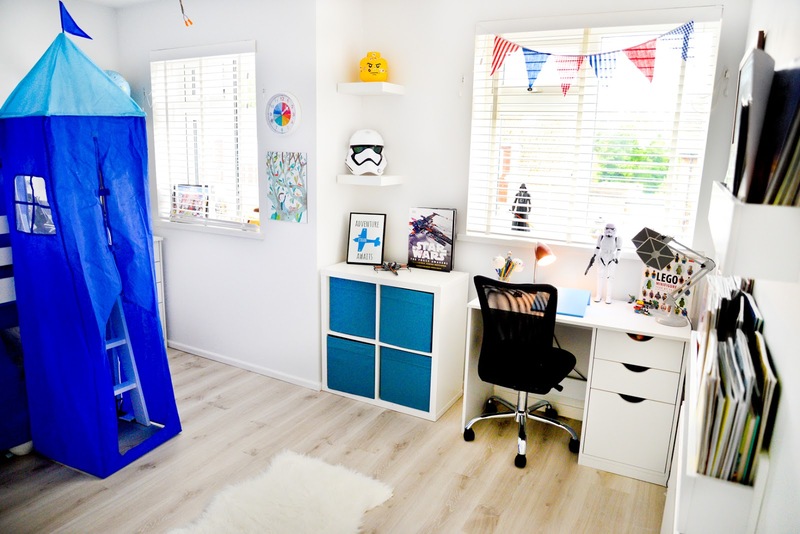 The furniture is fantastic quality and the perfect choice for us with wanting something that suits Ethan's young age but that will grow and stay with him over the years. And the smaller accessories are also great quality and such good value for money. We're so pleased with how the room is looking and we can't wait to share the finished room tour with you all very soon. If you'd like to read my children's room decorating top tips then head over to the Argos Home website: argos.co.uk to read my guest post. 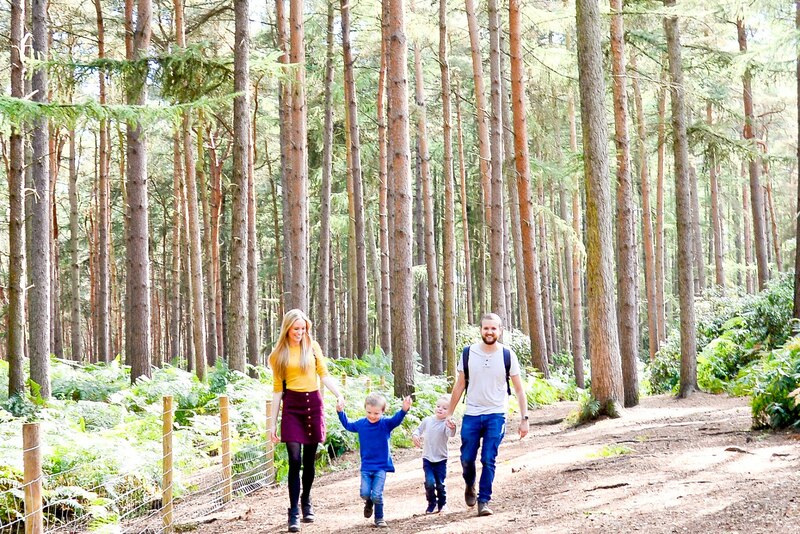 *I've collaborated with Argos Home on this post but as always all thoughts and opinions are entirely my own. You're right, this collection is perfect for his age! Gives him chamce to grow up and still mke use of it too, I love the desk, I need a new desk actually, I wouldn't of thought to look on argos. Great idea! It's all come together and looks lovely! 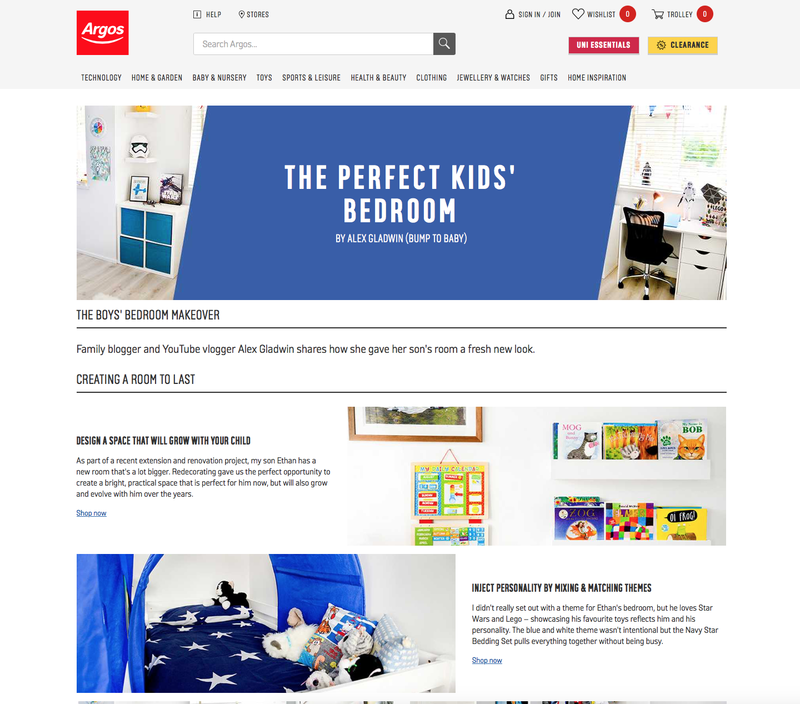 I never think of Argos for furniture but I really love the wardrobe, something we're currently looking for for my son's room. Ethans room is lovely, he must be so pleased with it. I love his wardrobe and drawers, I would happily have those in my bedroom. Argos isn't somewhere I think to look for furniture, need to remember it next time we need something! 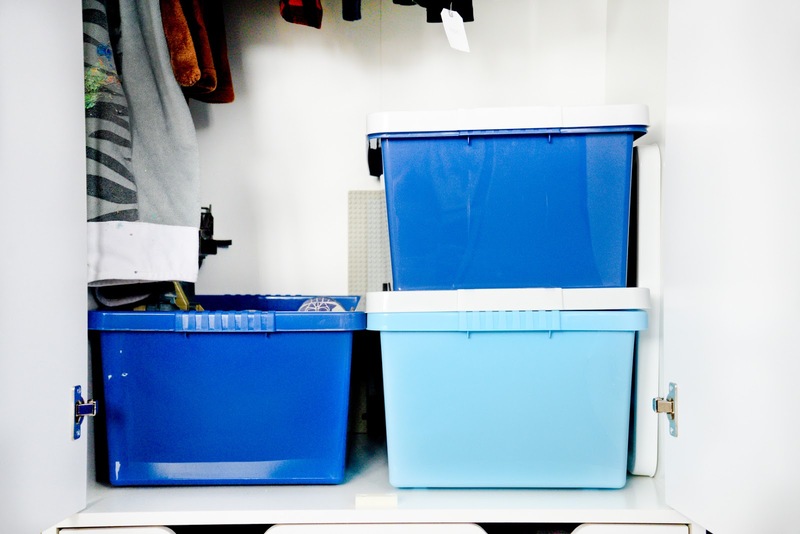 Boys and their toys can never have enough storage space, so these look perfect!